The number one rule if you are accused of sexual assault on or campus is: do not communicate with whoever is accusing you. It’s natural inclination to want to make the situation better or explain yourself to the accuser, but communication can be construed as retaliation or further misconduct. Remember, communication is not just by speaking, calling, or texting. It also includes social media messaging such as through Facebook, Twitter, Snapchat, or Instagram. Even if you want to say some kind words or apologize, you need to avoid any communication. If you have been accused of sexual assault on or off campus, contacting an experienced student defense attorney can help make sure your side of the story gets told. Contact DC Student Defense today! Hi, I’m Shanlon Wu with DC Student Defense. If you are accused of a sexual assault on campus or off-campus, the most important thing you must do is, don’t try to communicate with the person who’s accusing you. And by communicate I don’t mean just speaking or calling. I mean texting, Instagram, anything. Don’t communicate with them because it’s a natural human tendency if someone is upset about something that happened, for you as a caring person, to say I’m sorry about what happened. Those words will come back to haunt you. Not only that, any attempt to make things right or to find out what the concern is, can also be construed as some type of retaliation or further misconduct under a university student discipline code. Or the police, even worse, could believe that you’re trying to intimidate that person into not going forward on charges. So the number one rule if that terrible accusation surfaces is, don’t communicate with whoever is accusing you. 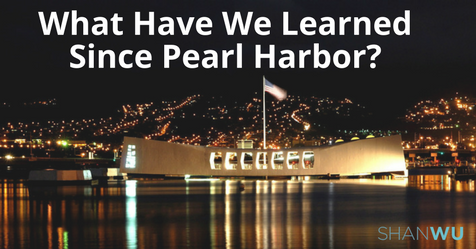 The National Security Generation: What Have We Learned Since Pearl Harbor?